I can't be completely sure because the focus of the shot from underneath isn't great, but I think that the edge of the fan duct with the cutout in it for the capacitor isn't sufficiently clear of the IR LEDs and phototransistor. Many thanks...here are some more pics with way better clarity! I'm using the ir probe for a year now, and my delta printer had gorgeous results : perfect first layers all the time. But now I'm having a very very strange result : The probe triggers way too high, about 5-6cm above the bed ! It makes the G32 calibration sequence impossible as it is very inaccurate too. What would be causing this? As anyone ever experienced such thing ? Edited 1 time(s). Last edit at 04/08/2018 09:28AM by Archiclem. David, is there a minimum recommended distance that the bottom edge of the sensor should clear any surrounding shrouds? It's probably sufficient for the shroud to be behind all of the lenses of the IR diodes and the phototransistor. I'll adjust the base edges of the surround to be around 1.5mm higher than the bottom edge of the board. Right now they are line-to-line. I'm trying to get the IR sensor to work now for a couple of months. Initially, I thought the PEI bed I used was the issue (although painted black on the back etc) so I upgraded the bed to a Buildtak Flex system but after installation, I still see a similar behavior, unfortunately. Buildplate: Buildtak flex (Buildtak on spring steel) - Buildtak flex is mounted on top of the heated glass bed. Trigger height: varies between 2.65 and 2.9mm - note: when G30 probing is used multiple times in a raw the accuracy is there but after a restart of the system it varies (e.g. nozzle is suddenly touching the bed or gap is too large to get the first layer down. Will take some screenshots of the bed compensation and mesh leveling process and post them here later. I assume I'm doing something fundamentally wrong or my assumptions that the variance should be much lower are incorrect. Variance using PEI (or any other IR-transparent surface) depends on the surface finish. I was getting quite good results with PEI painted block on the underside, but other user found that scuff marks on the PEI caused the trigger height to vary. One user sanded the to surface of the PEI using very fine grit sandpaper, and reported that this gave better results. But I haven't tried that. Variance using BuildTak or other opaque surfaces should be lower. 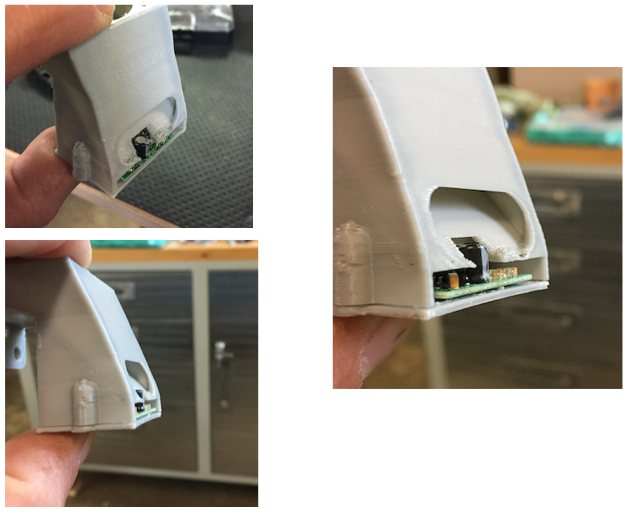 Obviously if the sensor isn't securely mounted, it may wobble and give inconsistent results.If the tilt of the print head or the bed varies, that will cause the relative heights of the sensor and the nozzle to change, causing an apparent different in trigger height. The sensor is securely mounted and does not wobble. I will run a few more tests to ensure the issue is not at another place in the setup and report back. I am having similar experience- sensor trigger heights change and vary between 2.65 and 2.9mm. I got the probe board 3-4 of weeks ago from Filastruder. I am using a RAMPS board with Marlin 1.1.8_bugfix and have tried both Bilinear and Unified Bed Leveling. My surface is 1/4" glass and I have tried it with and without hairspray. I painted my aluminum build plate with flat black grill paint- though I am tempted to give it another coat to be sure that its opaque enough. The glass sits on silicone heat transfer pads. Consistently, the bed level mapping results in the same shape for the bed surface- a saddle or Pringles potato chip, 0.8mm high at one corner, 0.4mm high across from it, and 0.2mm on the diagonal across from it. Thing is, when I take my machinist rule and lay it across the glass- there are no gaps or voids under laying it across the same directions. I just can not seem to get it to be consistent and zero out for the bed. Any thoughts or ideas or things to check? Bed mapping isn't only affected by whether the bed is flat. For example, on a traditional Cartesian printer it is also affected by whether the carriage remains at the same height at every position on the X axis, and whether the bed remains level as it moves in the Y axis. It's very common for the X axis to sag a little in the middle due to the weight of the carriage. This gives rise to a bed map that appears to bulge upwards in the middle of the X travel. It's also common for two smooth rods supporting the moving bed to be not quite level with each other so that they have a small amount of relative twist. This gives rise to a bed map that looks as if the bed is twisted. If the sensor isn't giving the same trigger height at different places, then obviously that will cause issues too - although if the measured trigger height variation is 0.25mm but the height map variation is 0.8mm then it evidently isn't the whole story. One other issue that can cause height map errors is if the tilt of the print head varies with XY position. This is a common problem on delta printers, but rare on most other sorts of printer. If the tilt of the print head varies with position, so will the relative height of the IR sensor and the nozzle. I had some trouble with the IR sensor back when i was running plain glass over an aluminum heatbed. Now I am running borosilicate glass 1/4" thick, and i have a proper ramps/marlin board running now..... so i have a question. Would it help or hurt to sand the top surface of that boro glass to make it sort of opaque. would the ir reflect better off it? sanding with something really fine like 220 grit, and an orbital electric sander. I have no experience with sanding glass but when I did the same to PEI I got height variance assuming due to the fact that the reflections are different across the surface depending on the sanding pattern and level. how can i delete a post entirely? Edited 1 time(s). Last edit at 06/13/2018 11:09PM by JKaechler. Hello, and thankyou for building a nice IR end stop soulution. 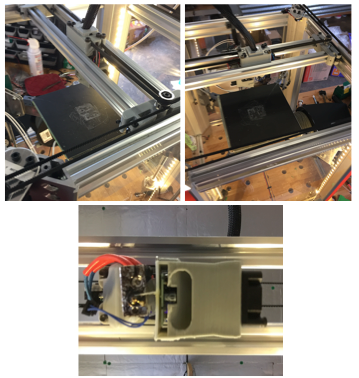 I installed in on my zonestar (RepRap Prusa i3 CLONE) witrh Marlin firmware. So I powered up the sensor and right away, LED come on and flashes 2 times, just like you said it would. After homing the printer and find that it will not goto Z home. Instead it goes up about 10mm and stops. With the sensor a long way above any surface, the LED on the sensor is off, and printer firmware does indicate that the sensor is triggered. With the sensor closer to a surface LED does illuminate and printer firmware does indicate that the sensor is NOT triggered. Rewriting firmware to my printer is not an easy task, as I do NOT have the source code and would have to do a complete install of Marlin. Is there a way to change the firmware on the height sensor, and what would I change. I replied to a similar question that was posted in the Prusa i3 section of this forum.